When you marry, you aren't just committing to your spouse; you're committing to the whole family. That's why these sweet wedding cake toppers with children make such a delightful addition to any wedding cake decor. 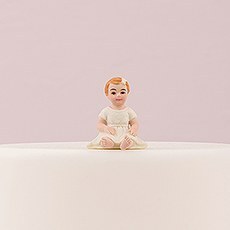 With boy and girl figurines of different ages from which to choose, it's easy to make sure that any kids feel included when their parents marry. Whether you're coming into a new marriage with kids from a previous one or you and your spouse-to-be have children together already, it's so crucial for kids to feel like they're important on this special day. 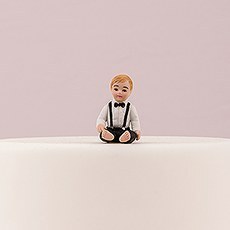 Adding child cake toppers to your wedding cake is just one small way you can make them feel included while emphasizing the formation of a new family together. 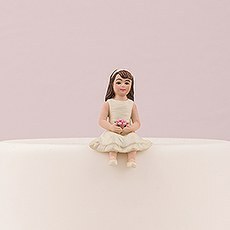 In addition to your own little ones, you might also want to choose one of these cake toppers as a gift for a bridal party member, such as a flower girl or ring bearer. 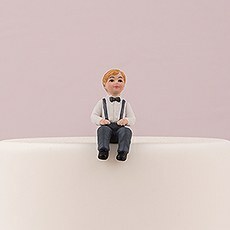 Our cake toppers with children even make sweet accents for birthday cakes as you little one turns another year older.In our collection of child cake toppers, you'll find a great selection of kids at various ages from babies to toddlers to preteens. Boys and girls are both available, and you can add a personal touch to your cake topper by choosing the right hair color for each child. Each porcelain figurine will be hand-painted to match the details you've selected. 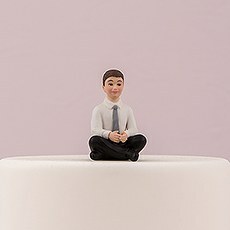 This will make any kid feel more special because their cake topper will actually resemble them. In fact, many children may even want to hold on to these figurines as keepsakes well after the wedding is over.Make sure you include all the personalized details that will make your wedding special by shopping at Weddingstar. We make it easy to design your own napkins, guest favors, stationery, decor and other essential wedding decor while sticking to your budget.